Belize is a spectacular country rich in teeming jungles, lush rainforests, dry pine savannas, tangled mangrove swamps, and dynamic coral reefs. It’s home to countless species of wildlife and creatures that inhabit the terrain including The Tamandua or Collared Anteater (tamandua mexicana). This diurnal and nocturnal, arboreal, terrestrial and solitary creature can be found in Central and South America; from the south of Mexico throughout all of Central America including Belize. It feeds mainly on ants, termites, and bees extracted after ripping apart their nests with their fore claws. Tamanduas can be seen foraging on the ground or in the canopy anywhere in the forest, but most commonly, at watercourses, where their prey may be concentrated. They have an average body size of 60 cm (23 inches); its tail would range as long as 50 cm (19 inches) and average a body weight of 6 kilograms (13lbs). 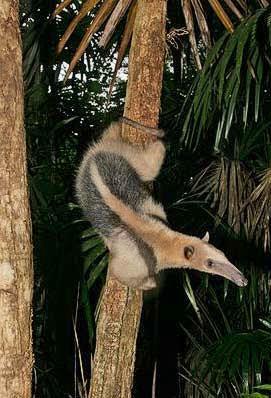 Tamanduas are medium sized, with a long prehensile tail. It has distinctive colors; blonde on the head, upper back and legs, with a black vest, or entirely blonde, or blonde with a partial vest. It has four large claws on its powerful forelimbs, five claws on hind limbs and the tail is almost naked, pink with irregular blackish splotches. Tamanduas can be seen foraging on the ground or in the canopy anywhere in the forest, but seem most common beside watercourses, where their prey may be concentrated. By day in the rainforest a dense cloud of flies and mosquitoes accompanies them so they often brush their eyes with a forepaw. When inactive, tamanduas rest in hollow trees, burrows of other animals or other natural shelters. Their local names are: Oso Hormiguero, Tamanduá, Susurete, Oso Amarillo, Brazo Fuerte, Oso Mielero in Spanish, ant bear in Belize and in Mayan it is called Chab. You wouldn’t think that a diet of only ants and termites could keep large animals happy, but the tropical anteaters like the tamanduas have figured out a successful strategy. Much like large bears can feed themselves by regularly visiting known berry patches, tamanduas return to the same ant and termite nests again and again to feed from the larvae found deep within. To the tamanduas, these small insects are a reliable food source which, although they seem small and non-nutritious to you and me, can support these handsome anteaters thanks to their many special adaptations. 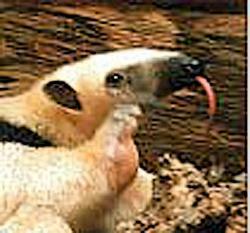 The most conspicuous distinctive mark of all Anteater species is their long snout and their extremely long tongue, the average tongue ranges from 20 to 23 inches in length. Tamanduas are mammals of the ancient order Xenarthra, which includes animals with very simple teeth or, as in the case of the tamanduas, no teeth at all. The tamanduas all have strong, muscular stomachs capable of grinding the ants they eat, instead of chewing them. Tamanduas show remarkable skill at capturing ants, thanks to their powerful front legs and sturdy claws that allow them to tear into ant nests and termite mounds, into which they jam their long snout and put to work their famous tongues. 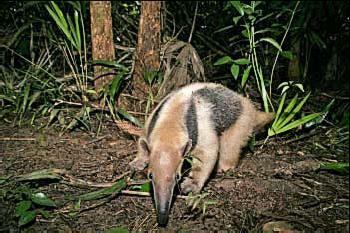 All anteaters have extremely long tongues, some up to 60 centimeters (23 inches) long! Equipped with backwards pointing hairs, and coated with gooey saliva, the tongue is used to scoop up ants and termites from inside the nest, and especially their larvae. The tongue is then pulled back into the snout covered with ants which are then swallowed. Since many ants and termites in the tropics live high in the trees, most tamanduas are adapted to an arboreal lifestyle, although they will spend considerable time on the ground if ants and termites are more abundant there. Arboreal tamanduas are equipped with a strong prehensile tail that grabs vines and branches while they climb and helps hold them in place as they use their front legs to tear open the nests of their prey. Because of their heavy claws, anteaters have had to devise a different way of walking when on the ground, where they lope along using specialized pads on the sides of the paws. Although they are normally slow moving, conserving their energy as they forage, they can run at surprising speeds when frightened. In the trees, their prehensile tail and the special shape of their paws (which has a central fold permitting them to grasp narrow vines) allows them to move easily and noiselessly through the forest canopy. Little is known of reproduction in Tamanduas; they mate in the fall and give birth to a single young in the spring. Births of twins have also been recorded. Females are polyestrous (ovulating more than once a year), with a gestation period of either 130 to 150 days or 160 to 190 days. They will set their young on a tree branch when feeding. Anteaters spend a lot of time teaching their young how to live off this specialized diet. Female tamanduas only give birth to a single offspring, which accompanies the mother for many months, riding on her back and clinging tightly to her fur. The youngster gradually learns the techniques for finding nests, tearing them open, sucking the ants and larvae from inside, withdrawing once defensive soldiers appear, and maintaining a map of feeding sites that it has visited. Because of this lengthy period of maternal care, tamanduas do not have high rates of reproduction, and are ill-suited to withstand the pressures of hunting and deforestation. Although they can be quite abundant in good habitat, they are infrequently seen by visitors to the tropics. Shy, they often flee at the sound of humans, or they may hide quietly on a tree branch high over your head. However, signs of their presence are common; by day, look for ant and termite nests with rough, large holes excavated in the sides, by night, listen carefully for the sound of dirt raining out of the treetops and striking the forest floor. This characteristic clue of a tamandua at work ripping into an ant nest is one of the most reliable methods scientists use to find anteaters in order to study them. This unique creature and its friends can be seen at the Belize zoo or if you are lucky, you can spot one in the hidden hallows of the rainforests.